There has been a lot said about refugees in Europe and Australia in the past week (well, more than usual), and rightly so. There are more refugees in the world today than ever before – in fact the UN estimates there are 59 million. There have been quite a few politicians and too many journalists who say that Australia has taken 4400 additional Syrian and Iraqi refugees in the past year. This is simply not true. In August 2014 the then Minister Morrison did announce 4400 for Syrians and Iraqis, but this was part of the existing intake, not extra. A very important distinction. So I made this fancy diagram to explain. 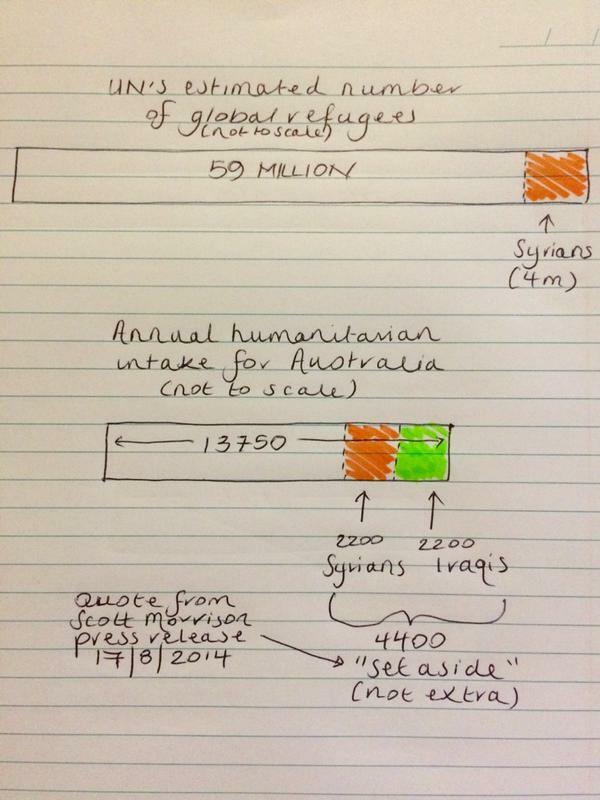 Australian politicians (and again, too many journalists) keep on saying Australia is very generous to refugees. I think, at the very least, that claim should be… challenged. 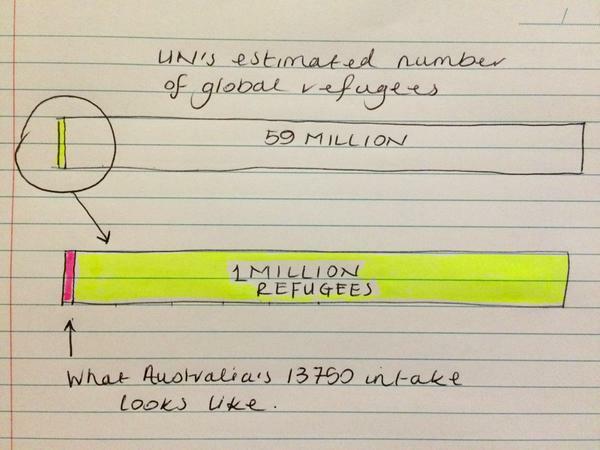 For a country as wealthy, spacious, and multicultural as Australia to only have an annual intake of 13750… well I thought it needed a fancy diagram for perspective. The bit that is being left out that is that that isn’t until 2018-19; three more years away. So I think it is a bit cheeky, maybe even desperate, to say that I reckon. You can read the press release from May 2012 about the actual timeline here. I made some fancier tables. Australia is a member of the G20, which makes it one of the biggest economies int he world, and certainly one of the wealthiest in the world. 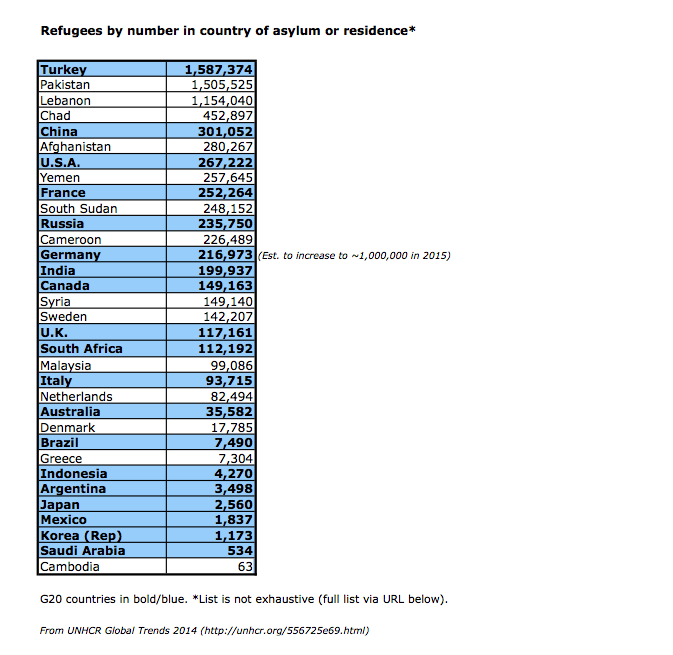 I wondered how it and other countries are at taking in refugees, so made this table. 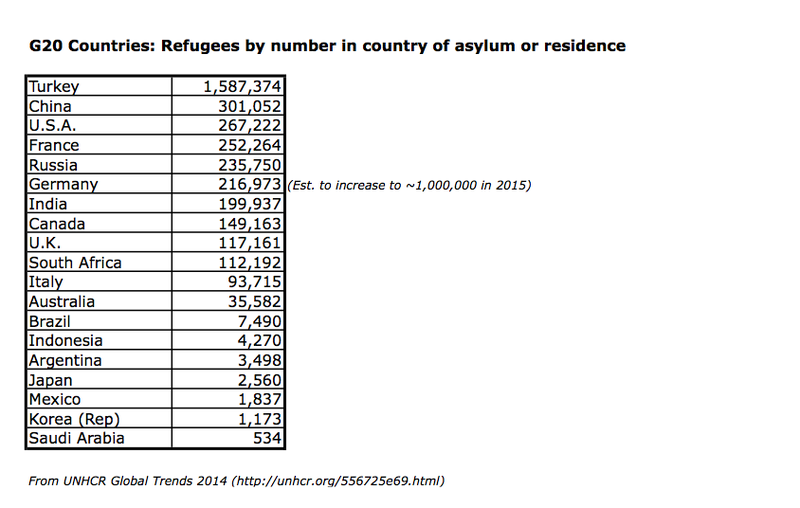 I then wondered how those numbers look in context compared to other countries (not all, but some). And this is what it looks like. Having been treated appallingly by Hungary Government in Budapest, the refugees decided to walk to the border of Austria. That is 170 kilometres. Without even getting into how humiliating would be (these are people fleeing a four and a half year war remember), the physical effort is amazing. It took about 8 hours for many. Men, women, children, wheelchairs, prams and crutches. On a good day, I can’t imagine walking that. But to do it, for example, carrying a baby, keeping an eye on children, in sandals, hungry, and sleep-deprived, in the dark night and rain? Respect. Here is a story of one small family who did just that, as shared by BBC journalist Matthew Price. *Obviously not fancy at all.